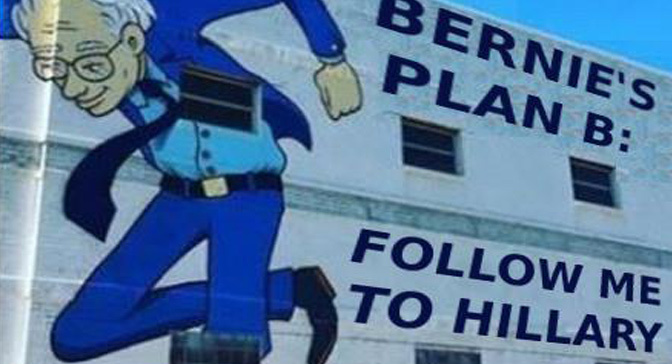 Bernie Sanders Has His Plan B. What’s Yours? Bernie Sanders wants and maybe deserves the Democratic presidential nomination. But Bernie does have a Plan B. Bernie’s Plan B is now and has always been supporting Hillary Clinton. Bernie said it a year ago, he repeated it last week, and he’s said it scores of times in between. It’s not a new plan , and his reason is not a new reason. Any Democrat, Bernie says including Hillary is better than any Republican. It’s a good thing Bernie does have a Plan B, because despite matching or exceeding Hillary’s open fundraising numbers (not counting super PACS and dark money) , despite beating Hillary in a number of crucial demographics, and regardless of the fact that Bernie polls better than Hillary against the likely Republican candidates, Bernie will almost certainly NOT be the Democratic nominee in 2016. You see, the numbers are against Bernie. Not the numbers of Democratic activists and voters, but the numbers tabulated by the Democratic party’s official rules. Those rules over the last generation have been drafted and crafted, honed and reworked by the same banksters, lobbyists, and plutocrat shot callers who have successfully resisted leftish challenges inside the Democratic party on the local and national level for decades. The Democratic party isn’t even remotely democratic. 15% of convention votes will be cast by unelected super-delegates —current and former mayors, governors, members of Congress and state legislatures and of course lobbyists, since that’s what large numbers of ex-office holders become in fact if not in name. So while Hillary has only a slim 1,289 to 1,038 lead in delegates won in state primaries and caucuses, the super-delegates are Clinton’s by a 15 to 1 margin, making Hillary’s lead a nearly insurmountable 1,758 to 1,069. Hillary is the Democratic front runner for all kinds of anti-democratic reasons. To name just one, she captured the black vote in primary states because black presidential, and even black local politics is almost entirely about fear of the racist Republicans, the white man’s party. The black misleadership class, almost unanimously Democrats possess no programs or visions of how to create the millions of green jobs their constituents need, or how to take the economy off fossil fuels, or how to halt gentrification, or raise wages. They have no clue how to end mass incarceration, lower the cost of housing, or halt the privatization of schools, roads, post offices, freeways and everything in sight. They don’t speak a mumbling word about curtailing the military budget, or clo”Bernie’s Plan B, when he gets around to it, will and has always been the black misleadership class’s Plan A, and the Plan A of the plutocrats who actually run the Democratic party….”sing the trillion dollar a year empire of a thousand US military bases around the world. Elected black Democrats simply flock to the Democrat with the most media, the most money and the most elite connections, no matter how right wing, as the first, last and only hope to beat the Republicans and continue their own careers. Without the feckless, lazy and corrupt black misleadership class Hillary’s candidacy would have folded long ago. To win now, Bernie has to carry New York and California by double digits, with several other miracles in between. Those Sanders supporters counting on miracles don’t need a Plan B, at least not till their leader gives them his. Bernie’s Plan B, when he gets around to it, has always been the black misleadership class’s Plan A, and the Plan A of the plutocrats who actually run the Democratic party. And make no mistake, thousands of Bernie’s activist supporters will line up behind their former candidate to get out the vote for a right wing Democrat. The internet noise about how millions of Sanders supporters will never back Hillary is partly the statements of a committed minority who really won’t back Hillary, partly hopeful recruiting propaganda for that minority, and partly wishful thinking. There’s always been the potential for a disaffected left to walk away from the Democratic party in a presidential year, which is why, ever since Jesse Jackson in the 1980s, the Democratic party has made room for sheepdog presidential candidates whose function is to herd leftward strays back onto the Democratic wing of the Party of the Rich until it’s too late to mount any organized opposition outside the two capitalist parties. Bernie is the Democrat’s 2016 sheepdog candidate. Democratic party honchos, as Glen Ford has been pointing out for weeks now, are already beginning to lunge rightward to pick up millions of whites who would otherwise vote Republican. It’s the classic Clinton playbook from the 1990s. So where will Sanders supporters go, if not with Hillary? It’s a good question. Every insurgent Democrat campaign generates fantasies among the committed of keeping the bus running and building a permanent base after the election. I confess to having passed pipes full of that stuff around myself in the 70s, 80s and 90s. It’s been tried. It’s not at all easy, in fact it’s difficult, really difficult, which explains why it it almost never happens. To name just a few factors, organization costs money, and donations stop when the campaign does. A campaign’s volunteer lists are private property too, which means your new organization has to steal them or engineer a way to acquire them without stealing. And neither the followers originally recruited to a candidate and campaign, nor the would-be organizers of what might come next are are necessarily up for studying movement building, organizational models, what works, what doesn’t work and why. It’s way more than just a notion. The Green Party’s Jill Stein will be on more statewide ballots than ever in 2016. But unless national and state Green parties wise up, tool up and train up quickly, they have no way to welcome thousands of activists into meaningful and effective local organizations, and Greens really haven’t given much thought or discussion to what such meaningful organizations might or might not look like. I’m the Green state co-chair in Georgia, and along with other Greens Party I’m working to build something they can fit into. The Green Party and the Jill Stein campaign will certainly be in Philly for the moment when Bernie throws in the towel and embraces Hillary. We’ll see where that goes. But we do know where Bernie is going. Plan A is the Democratic nomination, and it’s highly unlikely. Plan B is relatively certain –– it’s endorsing and campaigning for Hillary Clinton. If you’re feeling the Bern it’s time to ask yourself…. what’s YOUR plan B? 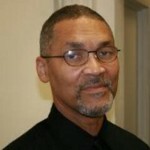 Bruce A. Dixon is managing editor at Black Agenda Report and a state committee member of the Georgia Green Party. He lives and works near Marietta GA and can be reached via email at bruce.dixon@blackagendareport.com.